Reefs.orgis pleased to announce the release of our new and improved communityweb site! It has taken our team well over a year to complete thislarge project, and we’re all very excited to bring you the results ofour efforts. Thesite has undergone a dramatic improvement of its organization. Reefs.orgis now easier, faster, and more accurate to navigate than ever before. On just the homepage alone, you can now read about the latest issue of Advanced Aquarist’s Online Magazine(AAOLM), find recent information about Marine Aquarist Courses Online(MACO), learn about upcoming reefkeeping events (such as MACNA andIMAC), and save money on the current sponsor’s Powerbuys. And thanksto the news feeds (using RSS), you will be able to stay up-to-date withnew article postings, newly listed Powerbuys, your personal searchresults, site announcements, new calender events, and more. It is important to stress thenew Reefs.org is not a mere superficial update; We are preparing ourcommunity for the next-generation reefkeeping portal, capable of endless possibilities. Reefs.orghas always prided itself on being a complete resource for reefkeepers,bringing innovation in how information is shared and acquired amongsthobbyist. 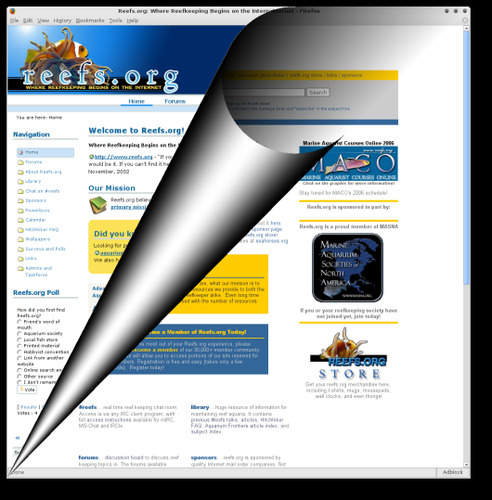 We were the first online reefkeeping chat (#reefs onafterx.net), a pioneer in dedicated reefkeeping forums, the first topublish a monthly, professional online periodical (Advanced AquaristOnline Magazine), and the first to offer an online curriculum formarine aquarists (Marine Aquarist Courses Online). Reefs.org has aproven history of being a “hobbyist-first” community, relentlesslyaiming to improve the hobbyists’ experience when other communities maychoose to do only what is required to stay competitive. As ourmembership and traffic grows, so must Reefs.org growto better serve our community. We will continue to strive forimprovement, and our new infrastructure will provide us with thisboundless potential. We invite everyone to join Reefs.org in ourvision. Today, Reefs.org is more readythan ever to be where reefkeeping begins on the Internet. Wehope you will share our excitement and join us in this new era ofcommunity building and informations sharing. If you are an avidreefkeeper with fresh ideas, a local society lookingfor new exposure, a manufacturer interesting in getting the word out onyour product line, etc. …. we’d love to hear from you. Have a comment or suggestion about the new website? We’d love to hear from you too. Click here to visit our Questions, Comments and Suggestions forum. Joe Yaiullo’s article, in this issue, on his creation of the Atlantis Marine World (AMW), now 6 years old has special significance for me. I vividly recall going into the basement of the New York Aquarium to see his creation of a reef tank that most professionals in those days said couldn’t be done. 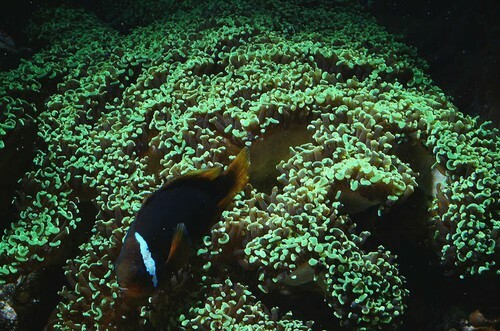 In fact, when confronted with Joe’s experimental 180-gallon reef tank (set up in the late 1980s) some insisted that Joe wasn’t really maintaining the animals in it, but was adding new ones as “last weeks” rapidly died. At that time in history, many marine biologists insisted that it was not possible to keep stony corals alive in captivity – tell that to my E. ancora, which has grown from a fist size fragment into a large colony 25-inches across over the last 20 plus years — let alone SPS corals like Acroporas. Now we know how to grow them like proverbial weeds. 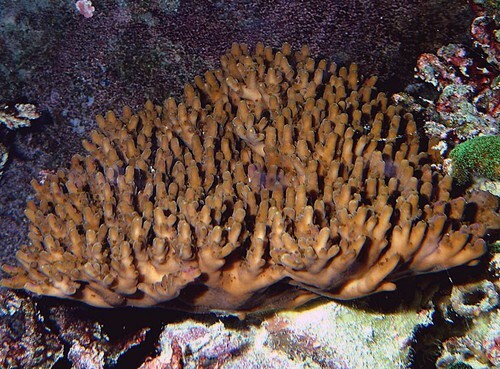 I also remember in those days going with Joe and Greg Schiemer to a guy’s house on Long Island, to his basement, where he had a small child’s wading pool filled with sea water, and about 24 pieces of PVC, with newly imported Acropora frags in each. We, and some other aquarists, surrounded the tub as if it was the center of some kind of strange religious ceremony, as we gazed at the Acropora frags. I still have an Acropora frag to this day that I bought then. I think it was at that time that Joe called himself and the rest of us coralaholics. A condition I might add that for most of us has remained uncured.